It’s one thing to bring jobs back to America and another to fill those jobs with a highly-skilled labor force. And whether we are bringing jobs back to America or creating new jobs in America, the skills required by those jobs are likely to have changed. Economies, and the skills and technologies that support them evolve over time. The jobs we once outsourced are becoming obsolete and are being replaced by new jobs to support modern technologies and other changes in our society and economy. The Bureau of Labor Statistics publishes the Job Openings and Labor Turnover Survey (JOLTS) report that tracks job openings, hires, and separations in the US labor market. Job openings indicate unmet demand for workers, while the hires and separations indicate the flow of labor. An analysis of US industries regarding job openings (high or low) and job hires (high or low), generates four different industry categories; (1) high hires and high job openings, (2) low hires and high job openings, (3) high hires and low job openings, and (4) low hires and low job openings. 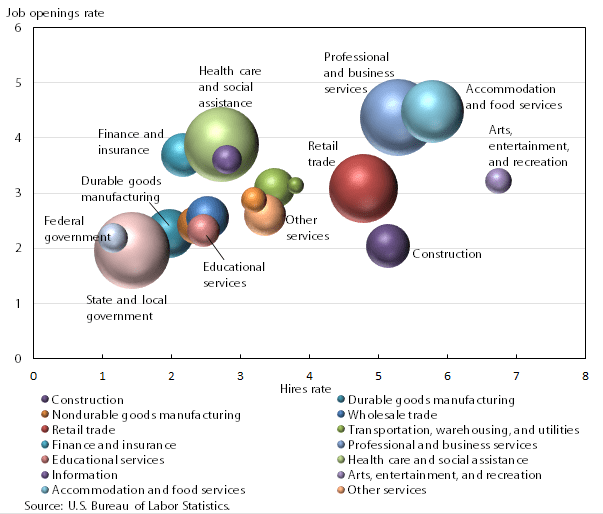 The following figure shows the hires rate and job openings rate by industry, with the bubbles sizes representing the relative size of each industry. Industries in this category exhibit little labor market activity and include the following industries: durable goods manufacturing, nondurable goods manufacturing, wholesale trade, educational services, the federal government, and state and local government. Although these industries employed over 37 million workers per month in 2014, very little hiring occurred and open jobs were scarce. Workers with particular skills may find employment within these industries, but workers seeking employment or career changes probably should not target these industries. Three industries are in this category; construction, retail trade, and arts, entertainment, and recreation. These industries either exhibit a lot of turnovers (separations with replacement hires) or are expanding. In either case, they have an easy time filling open jobs from the labor pool. Industries with a high hires rate and a high job openings rate were professional and business services, and accommodation and food services. The high rates on these two dimensions indicate that hiring is strong and more employees are needed. That these industries do have high hire rates indicates that they are able to find qualified workers, just not enough of them. These industries need workers and are having difficulty hiring them. Maybe they are not offering enough money or maybe they cannot find qualified workers. These industries include information, finance and insurance, and health care and social assistance. 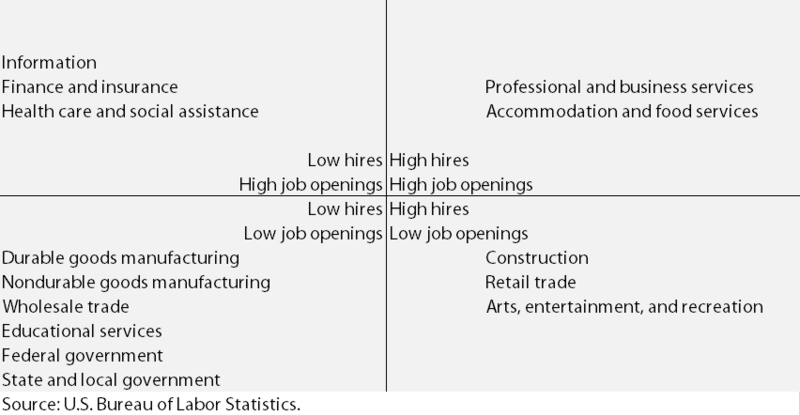 The following figure shows how the different industries stack up in the four quadrants. The low hires/high openings category represents the best industries to target for job seekers with the right skills and the best opportunity for training companies to focus on to develop those skills in the US workforce. Over the coming weeks and months, I’ll be looking more closely at current trends (the JOLTS data is from 2014). I’ll also be taking a deep-dive into the specific subindustries and geographical areas where the workforce has the greatest skills deficits, which represents the biggest gap to be filled by training providers. This entry was posted in Careers, Industries and tagged best industries for jobs, career opportunity, JOLTS.